There is nothing more quintessentially fall-like than sweet, fragrant and crisp apples. Mind you, this year was a bit unfortunate in apple-y news — there was an April frost that damaged many apple crops in Southern Ontario, unfortunately, and so there weren’t as many bushels of super cheap apples to crunch. 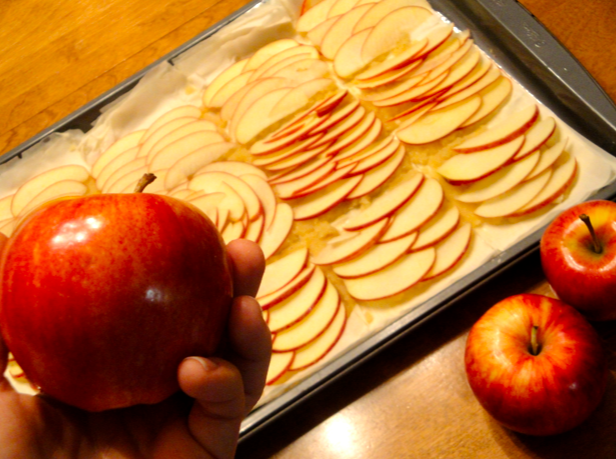 Nevertheless, apples are still in season, and that enough is reason to celebrate. And what better way to celebrate than with dessert? I went home a couple weekends ago to celebrate my family’s delayed Thanksgiving — we couldn’t get together during the actual holiday, but really, it doesn’t matter when we all sit down together to share mashed yams and brussels sprouts and corn — as long as we eventually do get to do it, that’s all that matters. As if celebrating Thanksgiving on a randomly assigned weekend wasn’t odd enough, we all decided we weren’t really feeling pumpkin pie as a dessert. We wanted something fall-like, light and apple-y — and these Apple & Almond Crackle Tarts were just the thing. Yields 12 servings. About 30 minutes of prep-work (not including 3 hours of chilling-time for the almond paste), as well as 40 minutes for baking. Adapted from Oomy Gooey Goodness’ Crispy Crackly Apple-Almond Tart Recipe. In one bowl, combine the flour, sugar and salt. In another bowl, whip the egg and vanilla together and then combine with the dry ingredients. Once it’s mixed, add in the cream and the milk — then cover it up and put it in your fridge for at least 3 hours. Preheat your oven to 350 degrees. Layer the phyllo dough sheets onto a baking sheet. 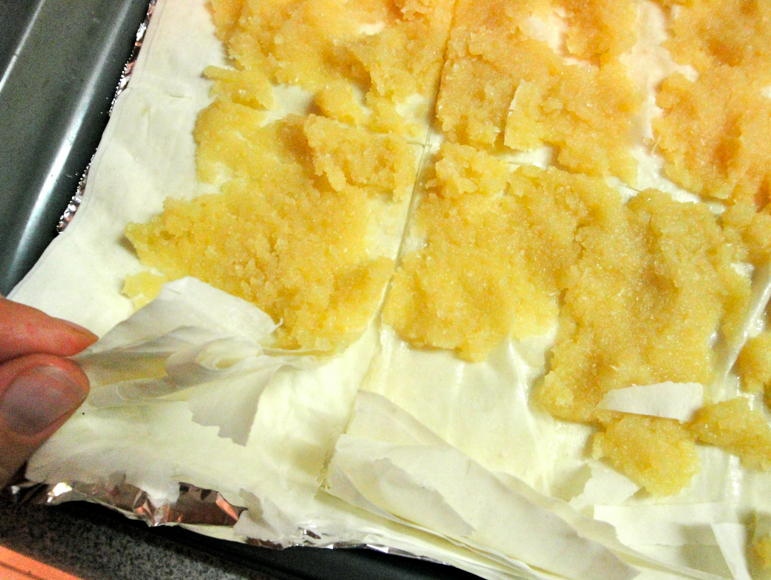 Slather on a bit of butter and sugar in between each sheet. When you’ve done all 8, take a fork and poke holes throughout the sheets. Next, take out your almond paste. When I baked the tarts, I just went ahead and tried to spread out the almond paste onto the top layer. What I’d suggest is either leaving it on the counter for a bit, or even slightly microwaving it to soften it up — it was a bit hard to spread out evenly. Once you’ve spread out the almond paste on the top layer of the phyllo pastry, pre-cut your squares — this is super important, because if you don’t do this, the dough will be too crackly and flaky to cut when it’s baked and it will be one big flaky mess! 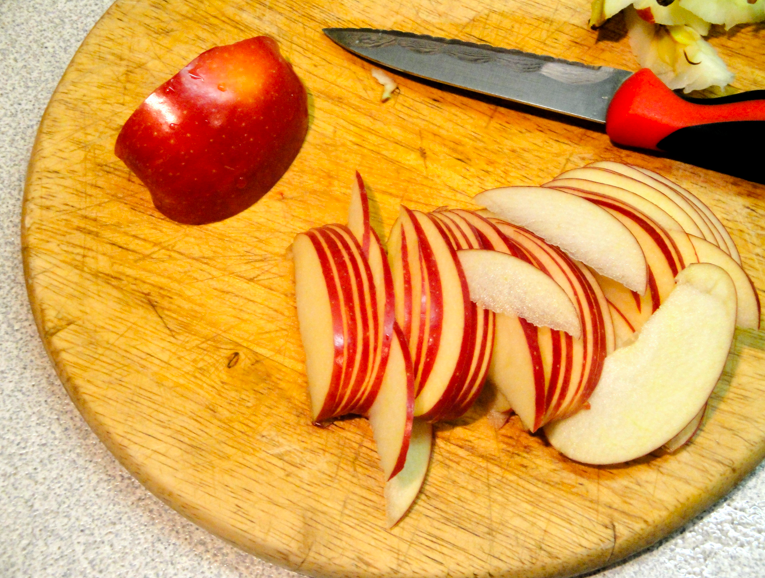 Next, take your apples and slice them up into very thin slices. 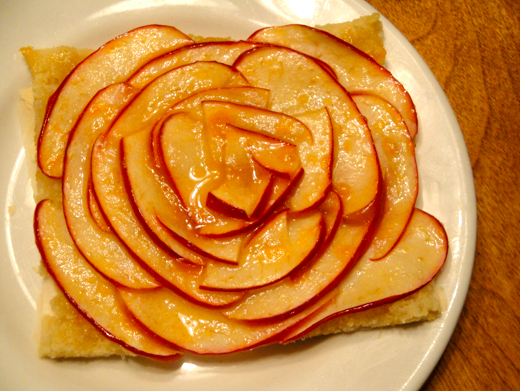 I used Gala apples, and went for the reddest ones so their skin would bring some lively colour to the tarts. 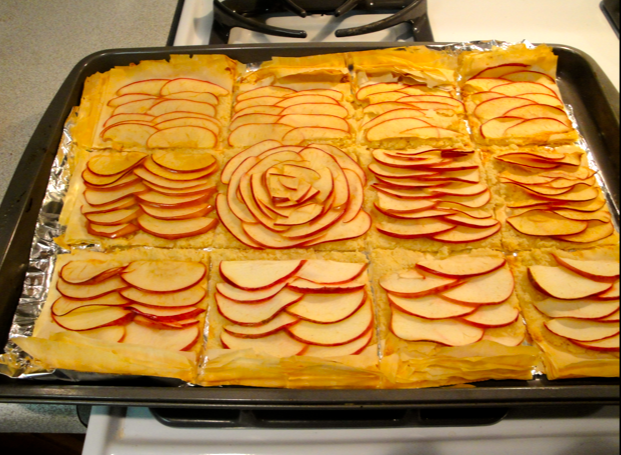 Splay out the apples on top of the almond paste, and then put the tart in the oven for about 40 minutes. Mix the jam and the water together, and then simmer it in a saucepan for a couple minutes. Once the tart is out of the over, glaze the top of it with the simmered apricot jam. Ideally, eat this while it’s still warm. The almond paste will be slightly toasted on top, but still soft and melty, and the glaze will moisten up the apples a bit. Have it with tea and relish the last bit of fall we have left — enjoy!